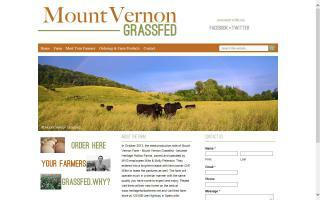 Mount Vernon Farm is a 100% grass fed grass-finished beef, lamb, and pastured (soy-free) pork & pastured (soy-free) egg farm. We utilize holistic, sustainable, and humane practices to bring the consumer the best possible product. Our animals are raised without the use of growth hormones, antibiotics, and zero pesticides or herbicides are sprayed on our pastures.